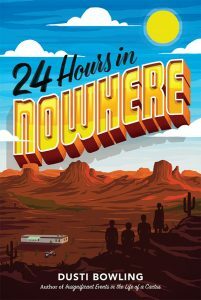 Around the time Worlds of Words received an advance copy of 24 Hours in Nowhere by Dusti Bowling, Lauren was a UofA College of Education senior working at WOW while doing her student teaching at Kellond. As luck would have it, Lauren met Dusti on a school visit that was part of the Tucson Festival of Books in March 2018. Now that the book is out, we felt it appropriate to conduct a follow-up interview. We asked Dusti about the book, what makes for a good school visit and meeting fans. 24 Hours in Nowhere is a heartwarming tale about two friends growing up in the least livable town in the United States. Nowhere, Arizona lives up to its name, with incredible high school dropout rates, bullies and intense poverty rates. For Gus, a 13-year-old boy with big dreams of college, the tiny town in the middle of the desert feels like a dead end. His bad lot in life becomes worse when Bo Taylor tries to force Gus to eat the notoriously dangerous jumping cholla cactus. One of the best dirt bike racers in town, Rossi Scott, comes to his rescue but in exchange for Gus, Bo demands her bike. This ensures Rossi can’t race against Bo in a competition that could change her whole future. Bo agrees to give the bike back under one condition; Gus brings him a piece of gold from Dead Frenchman Mine, a dangerous place from which few have returned. Joined by Rossi and a few others of Nowhere’s finest, Gus sets out to recover the dirt bike. The four bond over the difficulties of living where they do and go on an adventure that solidifies their friendship and makes life in Nowhere a bit more interesting. 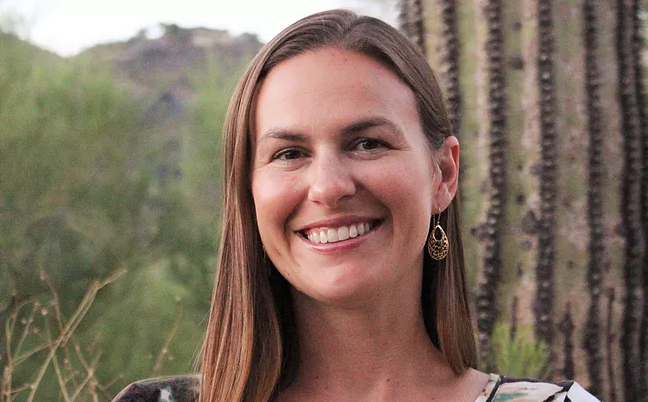 Dusti and her husband grew up in Arizona, and so she has a passion for writing about the desert. She tells WOW, “I remember what it felt like growing up in the hot, dry desert, not knowing anything else, wishing for green grass and towering trees and cool rain.” These days however, she loves the desert. It took leaving and coming back for her to realize how much this “wasteland” has to offer, including an arsenal of the toughest, most hardy plants, animals and people in the United States. “I actually set my books in the Arizona desert because I absolutely love it and think of it as anything but desolate,” she says. But it doesn’t always feel that way, especially in the extremely poor towns scattered all throughout Southern Arizona. 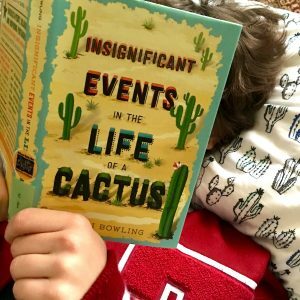 “As with my first book, Insignificant Events in the Life of a Cactus, I’m always hoping my stories encourage understanding and empathy for others,” says Dusti. For this particular story, placed in a hopeless setting, Dusti based the experiences of Gus on the reality of her husband’s childhood, growing up poor in a trailer with no running water. This background fundamentally affects a person’s life; there are not many opportunities for financial growth after living in such a situation for so long. Dusti aims to create a new perspective for readers and to help them see that factors such as geography, socioeconomic status and skin color can keep people from achieving their goals. She also, of course, wants readers enjoy the story while exploring these issues. “I hope readers get to see a new perspective, that it is often harder for others to achieve the same goals because of factors that are completely outside of their control, whether it is because of their income level, skin color, disability or simply geography. And, of course, I hope they enjoy the story without realizing just how much they’re learning,” she says. When it comes to discussion guides, Dusti does not mess around. Dusti’s discussion guides include a team who create and comb through suggested questions and activities to select the best ones. She wants the questions to evoke critical thinking and nudge readers in a direction they hadn’t considered. Of course, she also wants the guides to be relevant, interesting and fun. The discussion guides for both of her books have received positive feedback from teachers. Dusti enjoys school visits because she loves to share her books and the reasons why she writes about what she does. “Books were so important to me. They were my escape, friends, counselors and educators. Sometimes an adventure story is the only way a child might get to have these kinds of experiences,” she says. Meeting the young people who love her writing is a huge source of joy, but because school days are so busy, she wishes for more time for questions, signing books, one-on-one interactions and photos. Dusti loves meeting young readers at events. Hearing that her story had an impact on a child is one of her favorite parts of writing, and it’s why she chooses to write middle-grade novels. She wants to know the important issues that affect the lives of her readers because that’s what she aims to write about. Connecting with children through literature, addressing their hopes, fears and interests, is what she strives for when she creates her characters. Like most avid readers, Dusti also gets excited meeting authors. “I’ve felt star struck over and over again since I started this journey,” she says. She mentions meeting a number of admired authors including Nic Stone, Neal Shusterman, Victoria Jamieson, Jason Reynolds and Laurie Halse Anderson. But her most memorable author meeting was with Katherine Applegate, one of her favorite middle grade authors, at an event last year. Dusti got a copy of Wishtree and handed over a copy of Insignificant Events in the Life of a Cactus. “When she Tweeted that she loved my book, I just about passed out,” says Dusti.